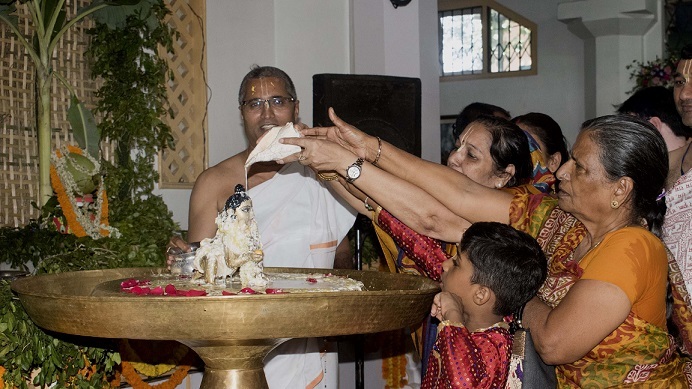 Amidst thousands of devotees, the ISKCON temple of Guwahati situated at South Sarania, Ulubari, also known as Sri Sri Rukmini Krishna Mandir, has celebrated Krishna Janmastami on Monday. The festival marks the events of Sri Krishna’s divine birth by Daivaki and Vasudeva at Mathura, mysterious episodes following his birth, and then his immediate shift to Nanda’s house at Gokul. To commemorate these episodes of Lord’s birth, Sri Sri Rukmini Krishna temple has organized a two-day eventful ceremony from September 3. The first day is devoted to the sewa to Balgopalji (service to baby Krishna) and the second day to Nandotsav. Because, as the legend goes, the first day is meant for Krishna’s birth and the second day is for the merriment of Nanda’s family on his arrival in their life. Thus, aside mangal arati, darshan arati, and sandhya arati that have been the common rituals of both days, Abhishek of Balgopalji or bathing baby Krishna is the chief event of the first day. This ritual is performed twice, first at 11 am and the second one at 8 pm. It is open to the donor devotees. Again, there is Maha Abhishek which is performed by the priests only at 10.30 pm. Another important event is the Akhanda Harinaam Kirtan by the kirtan troop that starts from 4.30 am and continues till midnight. Apart from this, there is a provision for the serene chanting of Harinaam through ‘108 Harinaam steps’. It is a platform made of several blocks on which the devotees can walk 108 steps while chanting Harinaam mutely. Distributing of prasadam (foods offered to the Lord) to all the pilgrims is an indispensable part of this occasion. ISKCON temple never lets its devotees to leave its campus without food. The sight of children from all walks of life hovering over the food stalls and relishing different food items confirms that it is a birthday celebration of a Child who is potent of a big Self. The chief rituals of day two are Srila Prabhupada’s Vyasa Puja and Nandotsava. On this day, the devotees perform Prabhupada’s Puja to venerate their ancient Guru, the founder of International Society for Krishna Consciousness. Through this worship, they surrender selflessly to the enlightened to guide them throughout their lives. They chant his name glorifying what he has done for the humanity. To bring in back the same mythical fun and merriment of Nanda’s family on Lord Krishna’s birthday, Nandotsava is observed. As a part of this celebration, the temple organization distributes prasadam generously among the neighbours and the temple workers to demonstrate the elation of mythical Nanda. Though the main celebration of Janmastami spans two days, the festival has a prologue and an epilogue. The onset of this festival is signaled by Jhulan Yatra Mahotsava observed on August 22-26 that depicts Lord Krishna’s romance with his consort Radha in the idyllic rustic groves of Vrindavan in which the Gopis, the friends of Radha-Krishna, also took part. Radhastomi Mahotsava draws the curtain of this carnival that will be celebrated on September 17. It is said that the wish of the devotees is left unfulfilled if they do observe Krishna Janmastami but not Radhastami. Appeasing the Lord without conciliating his consort is difficult in Hindu tradition!